A new study finds that Millennials have significantly increased the amount of money they’re saving for retirement since 2013, outpacing both Generation Xers and Baby Boomers. The average Millennial is now saving 7.5 percent of income, versus just 5.8 percent in 2013. 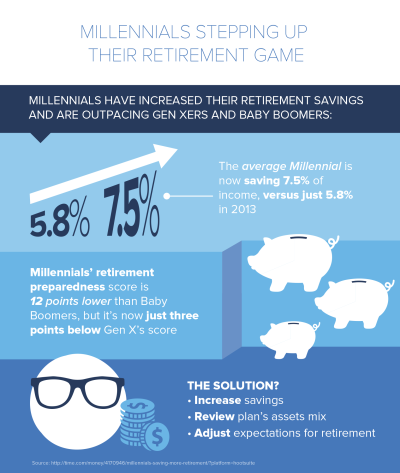 While that’s still less than what Baby Boomers and Gen Xers are saving annually (9.7 percent and 8.2 percent, respectively), it’s the largest savings increase among all the generations over the last two years. It’s a step in the right direction for a generation that has struggled with retirement preparedness for the last several years. Millennials’ retirement preparedness score is still 12 points lower than Baby Boomers, but it’s now just three points below Gen X’s score. Americans as a whole have improved their retirement prospects, too. The median retirement savings rate increased from 7.3 to 8.5 percent between 2013 and 2015, and it’s estimated that 45 percent of Americans are now going to be able to afford at least essential expenses in retirement, up from 38 percent in 2013. Despite the progress uncovered by the survey, though, the majority of Americans (55 percent) still aren’t “on track” for retirement. That means more than half the population is at risk of being unable to cover essential living expenses, including housing, health care and food. The solution? The survey’s experts say boosting retirement security comes down to three steps: increasing savings, reviewing the plan’s asset mix, and adjusting expectations for retirement by planning to work longer or live on less.